We all know that word of mouth is the best marketing tool there is. Why? Because when someone tells a friend, family member, neighbor, or colleague what a great tutoring company you are, you’ve already overcome the biggest hurdle to making a sale – trust. Networking is a great tool for building a referral network and increasing word of mouth business because it allows people to see you, hear you and watch you over time and that builds trust. There are a ton of networking opportunities out there for business owners. Including Chamber of Commerce events, Business Networking International (BNI), LeTip, Successful Thinkers, and dozens of others. Then there are the professional and social groups and associations, Rotary, Kiwanis, Soroptomist, etc. If your goal is to meet people who will help your business grow, then not all groups are created equal and like any marketing tool, it is important to have a strategy and to choose wisely. As business owners, typically our #1 goal is sales, and part of that process is to meet people who can help make our business a success. Whether they are potential clients, people who have access to and can introduce us to new clients, or successful business owners we can learn from. Every group we get involved in – whether it’s networking, charity, Chambers, or a committee, we join with that goal in mind. Some of you might think this sounds selfish and self serving, but it isn’t. Some of us are asked to attend networking events all the time, but each of us has a specific target market – and if a networking group consists of individuals and businesses outside of our target market, it won’t be the best use of our time and resources. Who is your target market? Affluent couples of teenagers? Double working parents? Single moms? Students? When considering a group or event ask yourself, is it going to help get exposure to that target market? If not, you should probably pass. d) Now add the totals of a, b and c together – this is the total cost of membership. e) Now divide the total cost of membership by your average sale amount to figure out how many clients you’d need to make this investment worthwhile. Think about the networking you’ve been doing, is it paying off? Ok, so speaking of your average sale amount – take a look at the clients you are getting from networking; calculate the average sale amount AND the profit margins, do they match up to average? Technically, both numbers should be higher than average if you’re networking in the right places, because they come to you pre-qualified and ready to buy because that trust hurdle has been overcome. 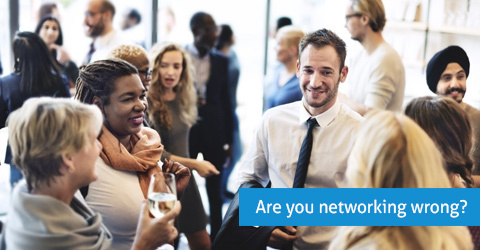 If they aren’t, you may be networking in the wrong places. Remember no marketing tactic is going to give you the results you need if you don’t put some strategy behind it. Plan. Analyze. Think. Take a look at these tips the next time you are thinking about going to another networking event or volunteering for another committee! Remember, time is money! Time is money, plug your profit leaks by working smarter. Click here.